A very early start to the day with Jan rising at 4.00am. We said our goodbye’s and left for Sydney airport before 7.00am hoping to avoid the majority of the morning traffic. We were largely successful arriving at Kingsford Smith Airport in plenty of time. Actually we discovered there was a one hour wait before our suitcases could be checked in. Despite my own weighing of the cases one was over the limit so I had to juggle some of the contents between them. However this wasn’t my major concern! I wasn’t sure how the security screening would go given I had a media tank, four hard drives, two gps units and numerous cables in my backpack. It took two attempts but eventually everything passes through the screening. Although our seating was economy my Gold Qantas membership gained us admittance to the Business Lounge where we indulged in some breakfast and I was able to read the morning papers. 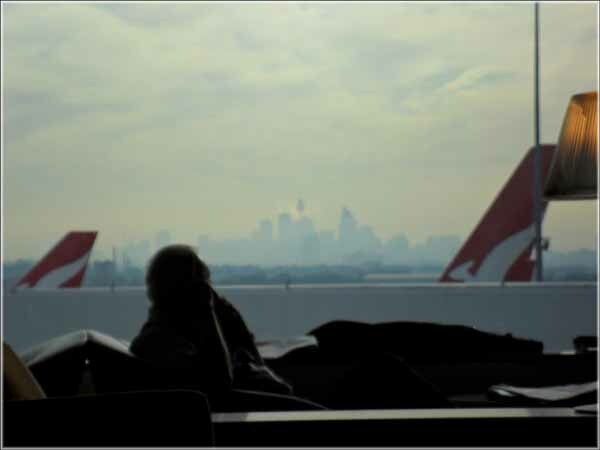 In the photo below you can see the morning cloud partially obscuring the Sydney CBD skyline from the lounge window..
We then wandered down the the departure gate. After glancing at the number of passengers waiting for the gate to open I immediately realised the aircraft wasn’t going to be full. My gold status enabled us to board early and we found our seats at the very rear of the 747. I had pre-booked the seats after looking at www.seatguru.com. At the rear of the jumbo there are only two seats beside the window rather than the usual three. Jan likes the window and I like the isle which makes this part of the aircraft ideal. There was no shortage of locker space as the aircraft was less than half full. The flight was uneventful. Jan dozed, whilst I read our eBook or watched a couple of TV episodes on the GPad. Jan did comment that the rear of the aircraft had a tendance to bounce around. For our next leg of the journey we will be seated right at the front of the aircraft, so it will be interesting to see if there is any difference in the “ride”. Last time we were both in Hong Kong the aircraft landed at the old airport (Kai Tak <sp?>). This time it was the new airport. I had previously passed through the airport when backpacking through China in 2000. However it seemed to have increased in size since my last visit. We caught the Airport Express train to the city. It’s a fast and reliable service, even if we struggled getting the suitcases on and off the train. We won’t have the same problem on departing Hong Kong as the bags can be checked in at the railways station. 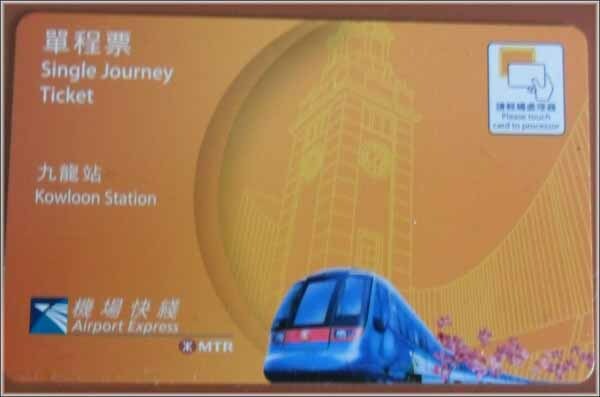 There is a complementary bus shuttle to the hotels from the railway station provided you show your train ticket for the journey from the airport. Our shuttle bus only had three stops and we guessed with our luck that ours would be the last stop on a full bus. We were wrong on both accounts. There were only two other passengers and ours was the first stop. I had booked accommodation at the City View Hotel on Kowloon. It’s one of at least two YMCA hotels in Hong Kong. We had stayed at the hotel on our last visit and thought it was centrally located and value for money. By the time we settled into our room Jan was feeling rather tired. I went out and found a small supermarket where I purchased teabags, milk, chocolate and a pot of noodles for Jan who had decided she was hungry. On my return to the room we discovered there was no cutlery and the packaged pot of noodles didn’t contain a disposable plastic fork. Jan eventually used the hotel two complementary toothbrushes as a quasi chopsticks! Unfortunately I couldn’t find the camera. Then it was time for a shower and bed. Woohoo! You're on your way! I've missed reading a few days and in that time you've flown off into the blue yonder. How exciting. Enjoy your shopping. What is the status of nb Waiouru?